In a Data Vault we connect all our (temporal) information to our business keys by creating hubs for them. The assumption here is that business keys represent stable identifiers for our data. We do know that sometimes business keys change. For this we have a SAME-AS Link that connects an initial business key to it’s successor. Together with a satellite tracking when this happened this technique is able to track the occasional business key mutation. When business keys not only mutate one-on-one but also merge or split you need to be able to report dependent information both on the original business keys as well on the newly merged business key without seriously restructuring your Data Vault. This is also possible using the same SAME_AS_LINK connecting source and target business keys and using a set of calculations that can be performed on a satellite that allow us to view these mutations in a consistent manner. We will not explore scenario 4 here because it is rare and rather complex. Rest assured this solution can handle this scenario as well. Implementing scenario 1 is left as an exercise to the reader. All scenario’s we can also distinguish a key preserving scenario besides the non key preserving scenarios. 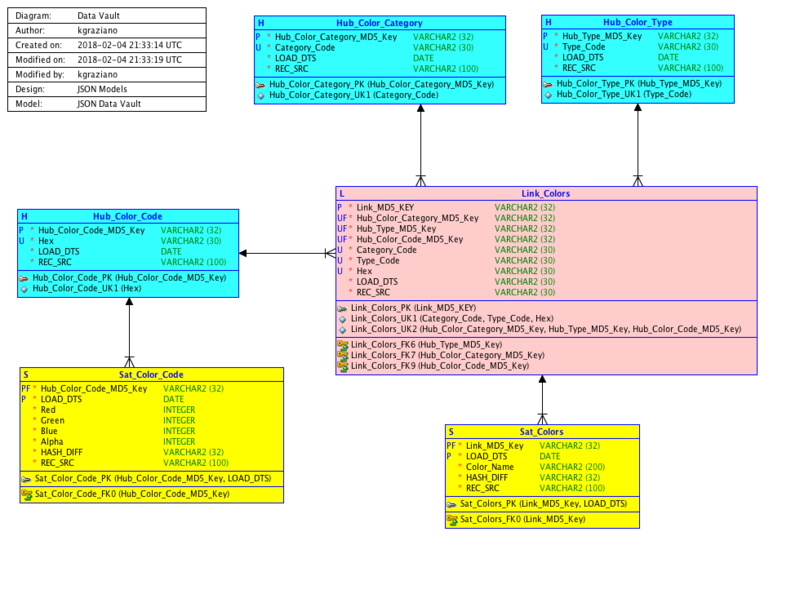 With Key preserving scenario the source and target key(s) overlap. 1. Key Replacement with key preservation: Key mutates into itself, Identity transform. As an Example we use the Hospitals example proposed by Martin Ekeblad. In there we have several Hospital (units) that are regularly reorganized. We assume the hospitals are frequently merged together or split into new units. We want to be able to track these actions consistently through time in a the corresponding Data Vault. We assume each hospital has a Hospital Number that is the business key identifying the hospital. We assume we have a table called Hospitals with several attributes and the business key. We also have a Hospital Mutation table recording the mergers and splits of the hospitals numbers. We also provide an insert/mutation date as basis for the Data Vault load date. We also have a table with mutations of hospitals, Hospital mergers as well as splits. Here we record initial and target hospital number. 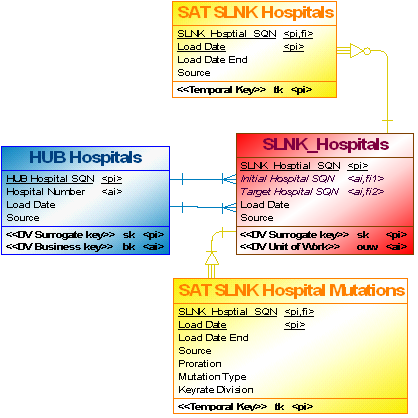 A derived satellite SLNK Hospital Mutations in which we will capture all changes in an uniform and consistent way using business rules. this LINK records the from and to Hospital as recorded by the source. This link has all the source/target records required to facilitate a full temporal consistent list of hospital mutations. tracks all detailed merger and split info. Note that this is assumed here to be mostly *derived* info that is created by subsequent business rules (ETL) code. Proration column to adjust amounts that need to be prorated across different hospital units after they have been split. This column is adjustable by using complex business rules. Transitivity Rule: Will calculate new LINK records in the SAME-AS LINK and sat that represent the transitive closure of repeated mergers or splits. This rule will also recursively calculate proration. We will show the actual process using several steps on a concrete example. We will use the data as shown at the source tables. The processing will be shown in 3 steps. Also we will use Business Keys in the links for this example. Also non essential load dates have been omitted as well. If business key splits are not expected this scenario, or a end dated one to many link can also be employed. In key preserving scenarios when doing mergers it just means we do not need to do end dating on the original key. When splitting we need to add a new record for the key with the correct proration for the split. We could opt for virtualizing parts of the business rules and creating a sparse mutation satellite. Esp the transitivity and identity rule are easily derivable. Just omitting them means the reporting queries become more complex. Specially when there are a LOT of business keys and the mutation rate is high.